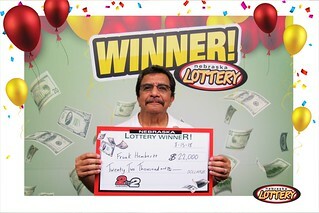 Frank Hembertt of Papillion won $22,000 playing 2by2 from the Nebraska Lottery. Hembertt purchased his winning ticket from Family Fare 799 at 1240 N Washington St. in Papillion. The ticket contained the winning Red ball numbers (10, 11) and White ball numbers (04, 11) from the August 13 drawing. Hembertt came into the Nebraska Lottery offices to claim his winnings on August 15 and said it was a quick pick ticket that netted him the jackpot. He’s a daily player on 2by2 but this is the first time he’s won big. He said he checked the numbers on the computer on Tuesday and after seeing all four of his numbers matched, he had to tell his wife, Ellen. Hembertt said he was in complete disbelief at his win, but that it was very exciting. The Hembertts are planning on using some of the money on home improvements, but they’ll be spending some of the $22,000 on their six grandkids. “They’ll get spoiled a little,” Ellen said.